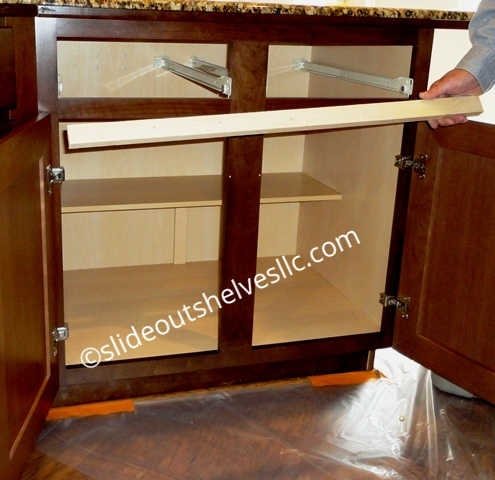 By removing the center stile on a cabinet' face frame, and attaching it to the door you can install wider pull out shelves inside the cabinet. 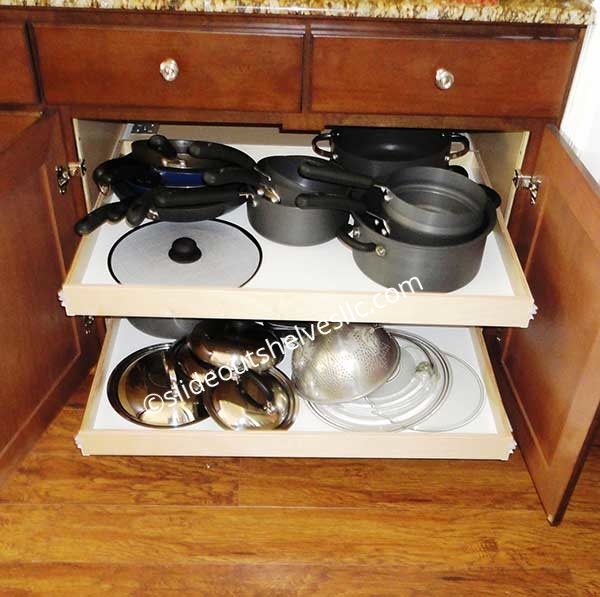 This can be done in less than an hour per cabinet! 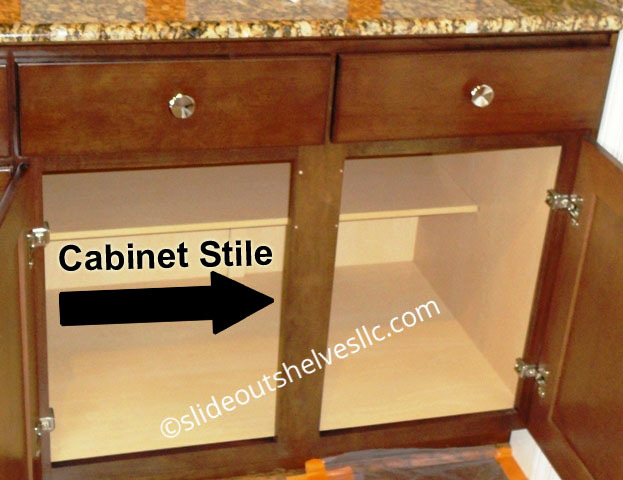 What is stile on a cabinet? 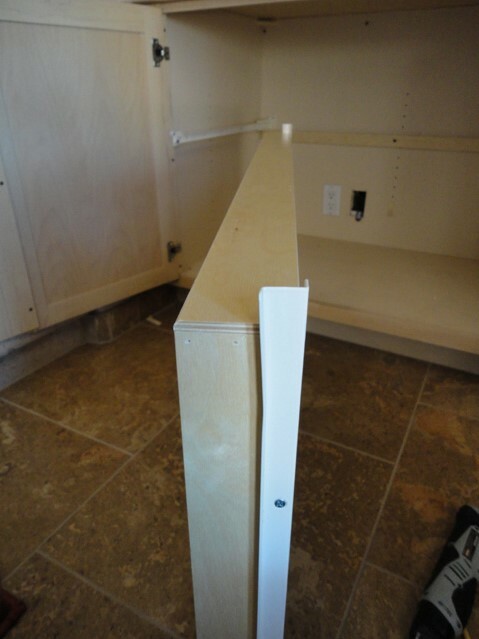 A cabinet stile is the middle supporting piece of wood directly in the middle of the cabinet's face frame. 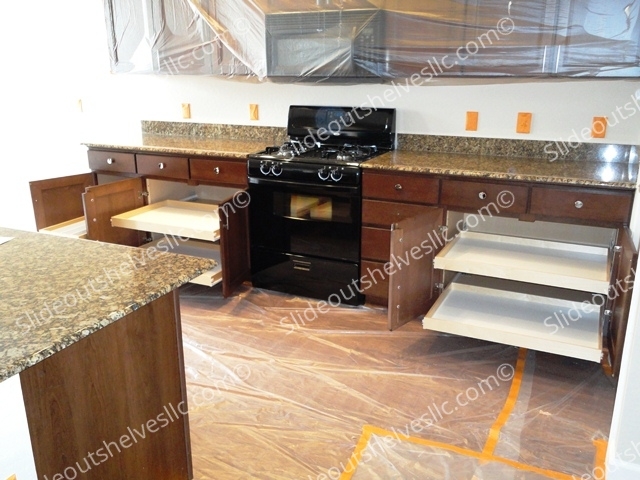 Our kitchen cabinets have granite counter tops which must be supported with a stiffener behind the drawer rails (do not do this conversion without the stiffener on cabinets with granite counter tops). 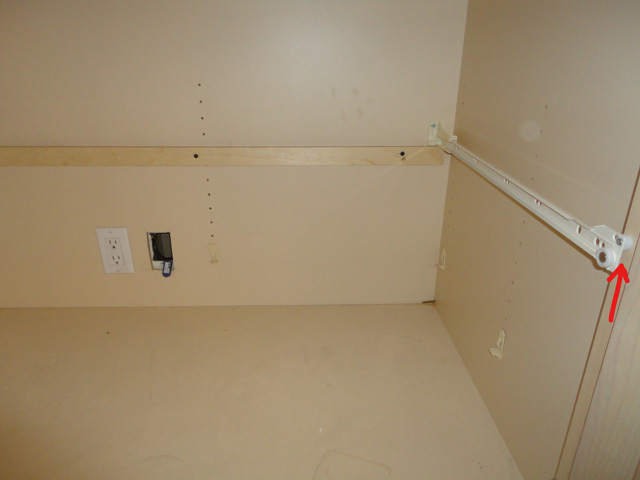 Use 1 1/4" screws to attach stiffener to cabinet. 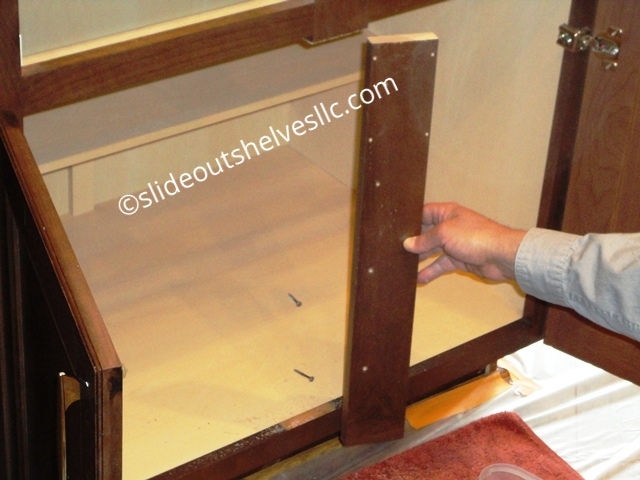 The stiffener is 3/4" thick and the cabinet face frame is also 3/4" thick so 1 1/4" screws will give solid attachment without coming through. 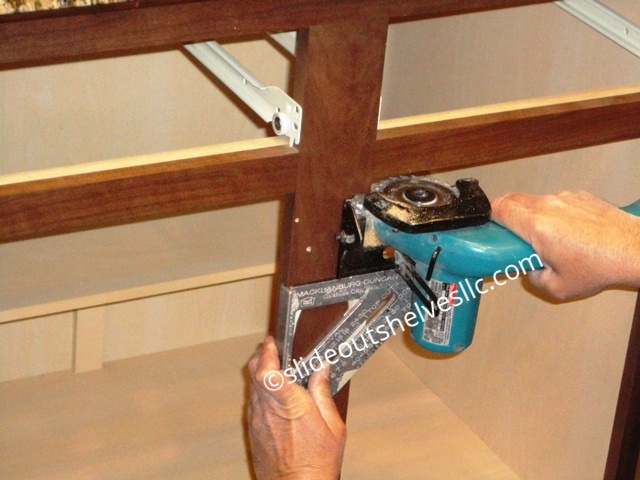 Apply a liberal amount of wood glue to the stiffener then using clamps to hold it in position screw the stiffener to the drawer rails. 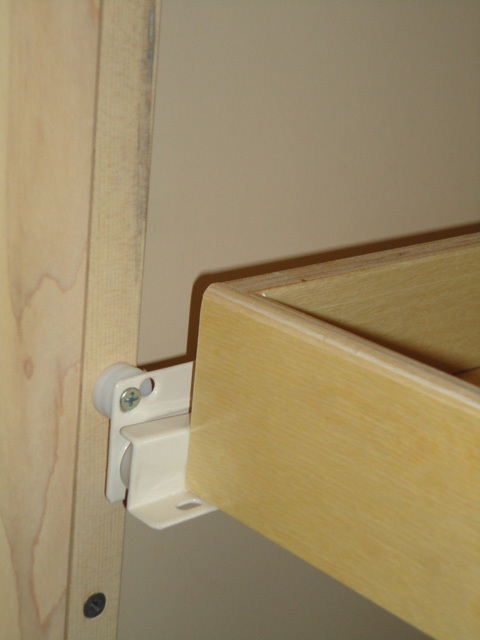 The cabinet that we are installing pull out shelves in has bumpers on the door, we are going to leave them on so that we do not get banging of the door against the frame when we are finished. Close the door onto the frame and make a pencil mark on the center stile showing where the edge of the door aligns with the stile. Drill 3-4 holes along the length of the center stile between the mark made for the door and the edge of the center stile. 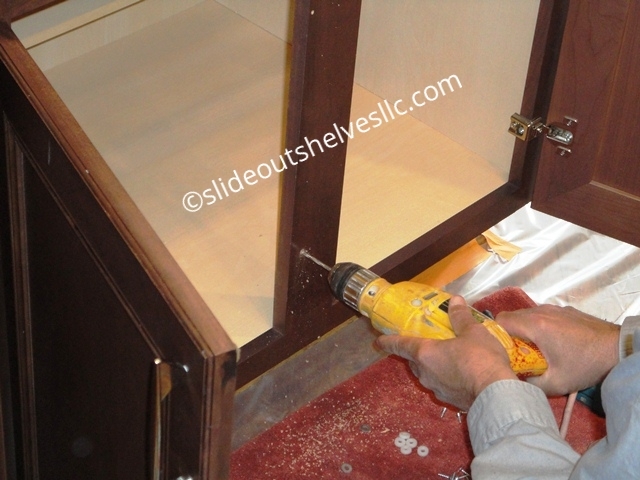 Drill entirely through the center stile, then close the door and from the inside of the cabinet make pilot holes into the door ( Caution: do not drill through the door, a small pilot start is all that is needed). Cut the top of the center stile with the cabinet saw or jam saw. You may need to duplicate the procedure on the stile bottom also. 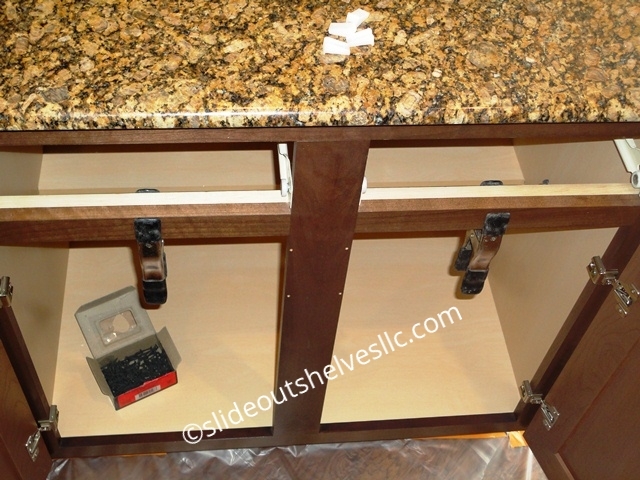 On our cabinet the bottom of the center stile is secured to the cabinet with pocket screws. Pocket screws will have a two slanted slots that pocket screws set in. Typically pocket screws are #2 square drive. This bit can be found at most hardware stores. 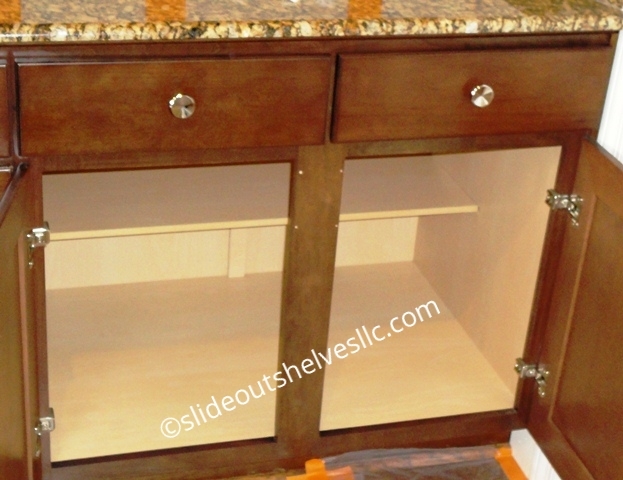 Our Cabinet now has the center stile removed and now can be attached to the door. 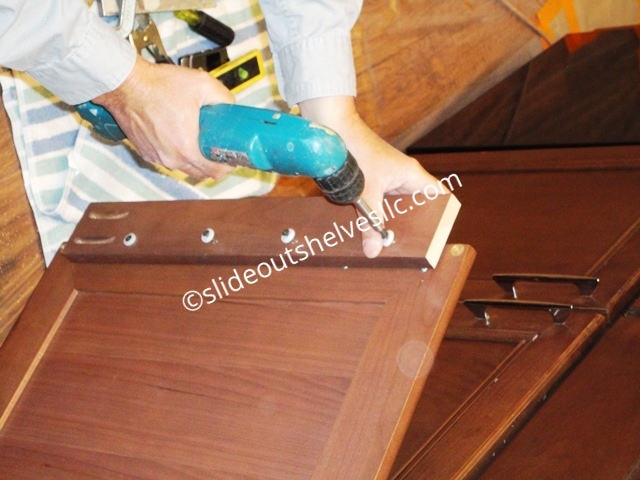 Attach the center stile to the cabinet door using the pilot holes drilled earlier. 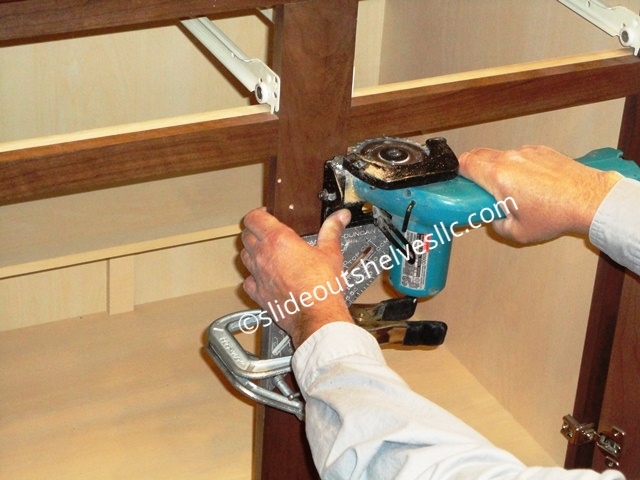 Tip: remove approx 1/16" from top and bottom of the stile with a saw or sander to give a small gap to prevent binding. We are leaving the handles on which pushes the board back away from the door, so to get a secure attachment as possible we used 1 1/2" screws with 1/8" spacers to attach the stile to the door. 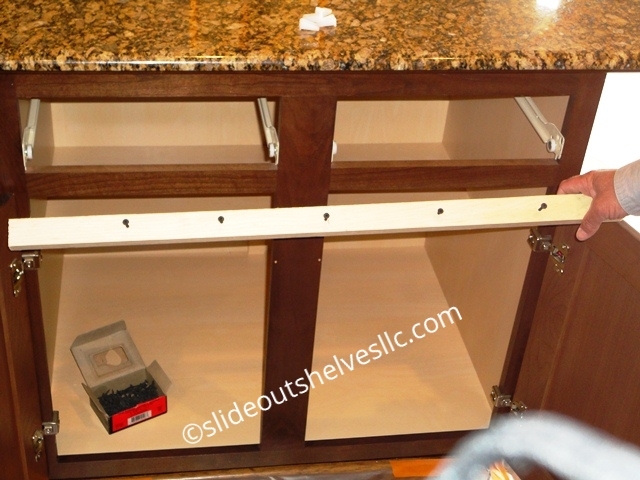 If your cabinet does not have handles then the spacers are not necessary. 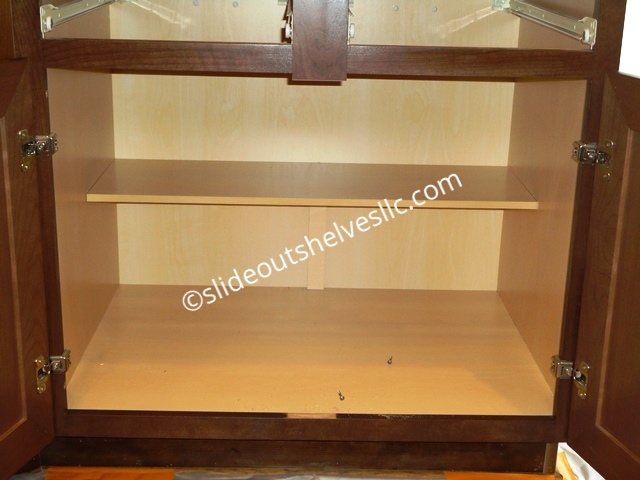 You are now ready to install the pull out shelves inside of the cabinet. 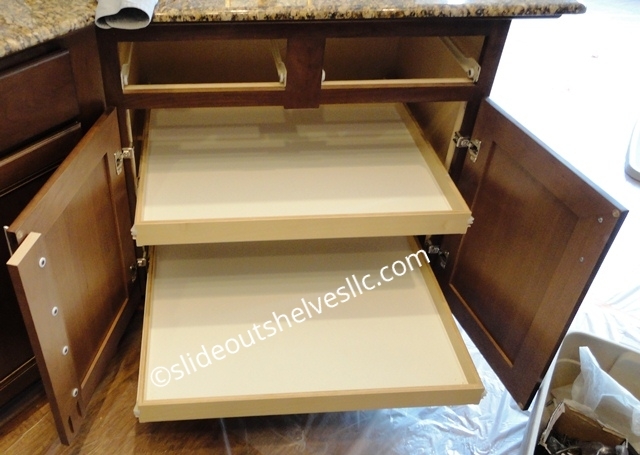 This kitchen has two cabinets with center stiles removed to allow for wider pull out shelves (the plastic was for paint prep, nothing to do with our work). 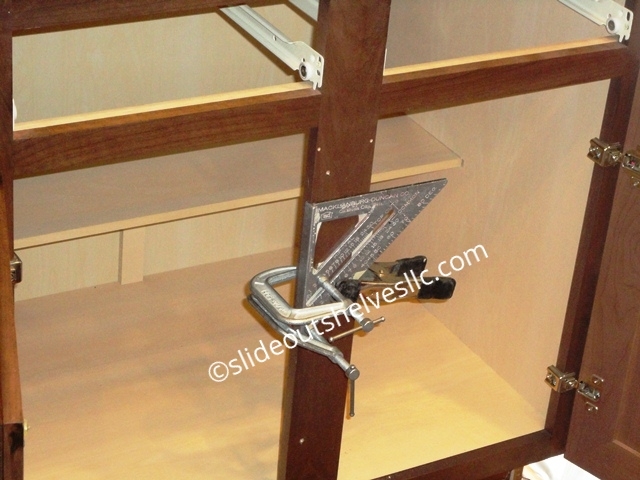 Move the drawer slide forward on the drawer 3/4-7/8"